Over the past three years, nine Miami police officers have been fired — accused of everything from unjustly shooting a suspect to sleeping on the job to firing a gun in a drunken rage while off-duty. All but one of them have gotten their jobs back through an automatic review process called arbitration. The latest officer dismissed, Adrian Rodriguez (above), is being investigated for his suspected role in a decade-old robbery and murder. Nonetheless, an arbitrator last month ordered him returned to the job. 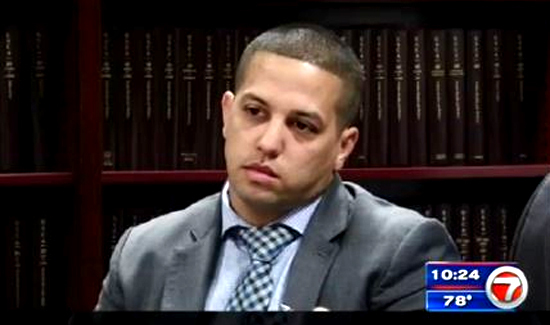 Fed up with the string of losses in police arbitration hearings, city officials are now planning to ask a Miami-Dade judge to overturn the Rodriguez decision, a step they haven’t pursued in previous cases. It’s rarely a successful legal tactic but one the police brass argues is forced by the prospect of allowing a suspect in a murder case to return to active duty. Rodriguez’s union-appointed lawyer, Eugene Gibbons, called any appeal “frivolous” and bound to fail. Arbitrators are agreed upon by lawyers on both sides, he said.